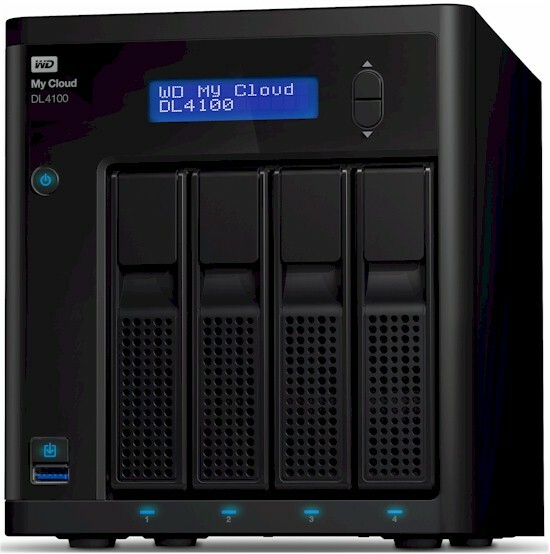 Western Digital recently announced four new NASes featuring faster processors and more memory than earlier models. Joining the Expert Series, which previously included the My Cloud EX2 and EX4, are the EX2100 2-bay and the 4-bay EX4100. Both devices are powered by Marvell ARMADA processors and should offer better performance than their older EX-series siblings. With the introduction of the 2-bay DL2100 and the 4-bay DL4100, WD is upping its game and moving into the business NAS market. Both the 2 and 4 bay NASes have dual Gigabit Ethernet ports and two DC power sockets (1 AC adapter included). Both are powered by dual-core Intel Atom processors and both have expandable memory. The two new DL series represent WD's first Intel-powered Linux-based NASes. You can find both new DL models at various online and retail stores, but as of the review date, they are not available on Amazon. The new EX2100 / EX4100 models are listed on Amazon but are currently showing 2 to 5 week availability. Although we tested the 24 TB DL4100 model, for the purposes of our NAS charts and NAS ranker, we are showing the 0 TB BYOD model so it is directly comparable to other BYOD NASes. For SKUs that ship with storage, WD uses the "Red" series of NAS-optimized hard drives and, of course, recommends them for the BYOD models. The DL4100 uses the same case layout as the new EX4100. The image below shows the callouts for the front panel. Though similar to the EX4, the front panel on the new NASes has the drive LEDs below the drives and there's a USB 3.0 port and Copy USB button that was missing on the EX4. The LED indicators, for the most part, function the same as the those on the EX4. You can get complete charts for LED status (front and rear panel) from the User Manual here. The callout image below shows the rear panel of My Cloud DL4100 and EX4100. If you purchased the BYOD version of the DL4100, installing disks is very easy. Page 15 of the User Manual details the steps I've included below. I like that you can install the drives without any tools. However, for a NAS targeted at businesses, individual drive locks would add additional security for a device that might not be physically secure in a small office environment.